We are up to part eight in the 2015 College Football Preview with a closer look at The American Athletic Conference’s West division. Also included is the Championship Game prediction for The American. As a reminder, below is 2015 College Preview Schedule as well as links to conferences already previewed. Below is the preview for each team in The American’s West Division. 2015 will be very historic for the Naval Academy. For the first time, they will be playing in a conference after 124 years of independence. It will be Ken Niumatalolo’s eighth year at Navy and he has only had a losing record one time, which was in 2011. There will be only four starters back on offense for Navy, but the most important one is quarterback Keenan Reynolds (pictured at the top). Reynolds ran for 1,191 yards and 23 touchdowns while also throwing for 843 yards with six touchdowns and 3 picks in 2014. He also had some injury issues and will have his top target back in Jamir Tillman (20 catches for 386 yards and 3 touchdowns). 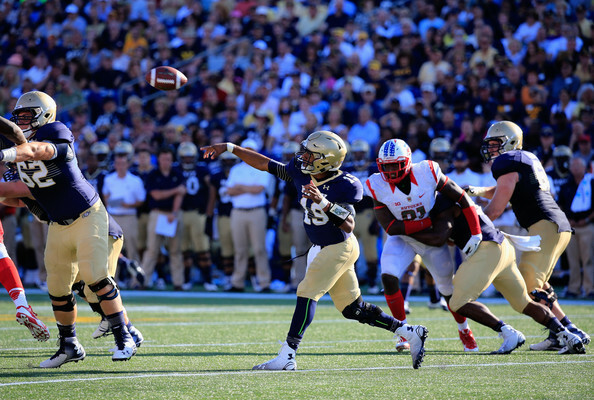 With the triple option, the quarterback will also need to have his running backs help out. Chris Swain ran for 693 yards as the third leading rusher. Watch out for DeBrandon Sanders, who ran for 231 yards and 3 touchdowns on 29 attempts for an average of 8 yards per carry. The last time Navy had only four starters returning on offense, they averaged 28 points per game (2009). The offense will be fine in 2015. The defense is in better shape with six starters back from a unit that gave up 27.3 points and 404 yards in 2014. The defense will be set up in a 3-4 scheme and has two starters back on the line with Will Anthony as the top threat. He finished 2014 with 67 tackles, 2.5 sacks, and 8.5 tackles for loss. The linebacking unit has only one starter back in Daniel Gonzales, who had 86 tackles in 2014 to finish second on the team. and also intercepted three passes. Another strength on the defense will be the secondary with three starters back. The defense should acclimate well in The American during 2015. Navy opens with a home game against Colgate before a bye week and then facing East Carolina at home. Their other non-conference games are against Air Force at home on October 3, at Notre Dame on October 10, and, of course, the Army game on December 12 in Philadelphia. From the East, they will have East Carolina (home), Connecticut (road), and South Florida (home). They will have road games against Memphis and Houston during, but should be in contention to win The American in their first season. Houston will be under the control of Tom Herman after Tony Levine was fired following a 7-5 regular season in 2014. Herman has no prior head coaching experience, but he helped coach the trio of quarterbacks at Ohio State (Braxton Miller, JT Barrett, and Cardale Jones) in 2014 that culminated in the National Championship victory. The importance of the quarterback spot in the modern game cannot be understated. Herman will have five starters back on offense. Wide receiver turned quarterback Greg Ward Jr. threw for 2,010 yards with 12 touchdowns and 7 interceptions while Adam Schulz and Kyle Postma will also have a chance to win the starting QB spot. Kenneth Farrow and Ryan Jackson are both back at running back, which will help out the QB. Farrow ran for 1,037 yards and 14 touchdowns while Jackson ran for 610 yards and 5 touchdowns. Ward even ran for 573 yards and 6 touchdowns as the third leading rusher. The top two receivers are gone, which will put Demarcus Ayers (33 catches for 335 yards and 2 touchdowns) and Steven Dunbar (20 catches for 286 yards) in line to take over at receiver. The offense put up 29.8 points and 414 yards in 2014, but may do slightly worse with a new coach in 2015. The defensive side of the ball will have six starters back, but the losses are heavy in the front six. Only one defensive lineman (BJ Singleton) and linebacker (Steven Taylor) return. The strength for the defense will be the secondary with four starters returning from a unit that allowed 200 yards passing and only 55.8% completions against them a season ago. Adrian McDonald finished 2014 with 75 tackles (third on the team) and 5 interceptions while being named to the AAC 1st Team. There will be some struggles in the front six, but the secondary should help the defense perform solidly overall. Houston will have an easy opening week test against Tennessee Tech before a road game against Louisville. They face Texas State at home after a bye week and Vanderbilt will also come to town on Halloween (Oct. 31) to round out the non-conference portion of their schedule. In conference, Houston faces Central Florida (road), Cincinnati (home), and Connecticut (home) from the East division. Houston will face both Memphis (Nov. 14) and Navy (Nov. 27) at home and that could be the difference to win the AAC West. Memphis made a massive jump in year three of Justin Fuente’s tenure in 2014. After going 7-17 in his first two years, Fuente led Memphis to a 10-3 record in 2014 and looks to continue that momentum this year. In 2014, the offense produced 36.2 points and 427 yards per game with nine starters returning. In 2015, there will be eight starters returning led by quarterback Paxton Lynch. Lynch threw for 3,031 yards, 22 touchdowns, and 9 interceptions. He also ran for 321 yards and 13 touchdowns on the ground. The top running back from 2014, Brandon Hayes (949 yards and 5 touchdowns), is gone, but the combination of Jarvis Cooper, Sam Craft, and Doroland Dorceus will try to replace him. That trio will have four starters back on the offensive line to help lead the way. 2014’s top receiver is also gone (Keiwone Malone with 45 catches for 555 yards and 4 touchdowns), but his numbers are not too much to replace. Mose Frazier had 47 catches for 405 yards and 3 touchdowns while Tevin Jones caught 33 passes for 442 yards and 3 touchdowns. Memphis should be able to put up around the same numbers they did in 2014. Memphis’ biggest concern is the defense with only three returning starters. The three starters back, Ernest Suttles, Jackson Dillon, and Reggis Ball, will be leading their respective units. Suttles, a sophomore defensive lineman, will be joined by Latarius Brady and Mike Edwards. Dillon finished with 43 tackles, 3.5 sacks, and 5.5 tackles for loss at the hybrid linebacker spot in 2014. Ball will be back at free safety as the top returning defensive back. After giving up only 19.5 points and 350 yards per game in 2014, the Tigers can expect a modest rise in those numbers with as much inexperience as they have. Memphis will open the season against FCS Missouri state before back-to-back road games against Kansas and Bowling Green. Their final non-conference game will be at home against Ole Miss on October 17. In conference, Memphis will face Cincinnati (home), South Florida (road), and Temple (road) from the East. The deciding games will take place in the span of a week with a home game against Navy (Nov. 7) and a trip to Houston (Nov. 14). Memphis has a chance to win The American’s West division, but at the very least can expect a bowl appearance. Tulane has been through some tough times since the turn of the century. Between 2003 and 2012, Tulane did not make a bowl game, nor did they have a winning season. Curtis Johnson ended that streak in 2013 with an appearance in the New Orleans Bowl, but lost 24-21 to UL-Lafayette. Tulane fell to 3-9 last year and Johnson will be looking for a bounce back year in 2015. Nine starters are back for the Green Wave on offense in 2015 including quarterback Tanner Lee. As a freshman last year, Lee threw for 1,962 yards with 12 touchdowns and 14 interceptions. Fellow freshman running back Sherman Badie is also back after running for 688 yards and 3 touchdowns, but he will also be joined by Lazedrick Thompson (533 yards and 4 touchdowns) and Dontrell Hilliard (452 yards and 3 touchdowns). Two of the top three receivers are gone while Teddy Veal returns after 40 catches for 381 yards and a touchdown in 2014. Terren Encalade finished with 20 catches for 235 yards and the receiving group should do better as long as the quarterback play is better. The offense struggled in 2014 putting up only 16 points and 347 yards per game, but those numbers should improve in 2015. The defense will have seven starters back after giving up 28.4 points and 388 yards per game. Three of the defensive linemen return including Royce LaFrance. LaFrance had only 34 tackles last year, but recorded six sacks and 5 tackles for loss. It is rare to mention Bob Marley in a football article, but his grandson Nico Marley is back at linebacker. Nico Marley recorded 82 tackles (second on the team), 0.5 sacks, 13 tackles for loss, and an interception while being named to the AAC’s 3rd Team last year. Two starters are back in the secondary in Parry Nickerson and Darion Monroe. Nickerson had 51 tackles, 2.5 tackles for loss, 6 pass breakups, and 6 interceptions while Monroe had 73 tackles, 1 sack, 4 tackles for loss, and 2 interceptions. The defense should be able to improve on their 2014 numbers. Tulane has a rough opening to the season with a home game against Duke and a road game versus Georgia Tech before FCS Maine visits in the third week. They face Army on the road November 14 to close out their non-conference slate. Tulane will face Central Florida (home), Temple (road), and Connecticut (home) from the East division. The tough schedule for Tulane also includes conference games against Houston, Navy, and Memphis. Tulane will be better in 2015, but the schedule makes it tough for them to reach another bowl game under Johnson. Todd Graham led Tulsa to three double digit win totals between 2007 and 2010 before leaving for Pittsburgh and then Arizona State. Bill Blankenship took over in 2011 and led Tulsa to 8 and 11 win seasons in his first two years before everything unhinged, going 5-19 his last two years. Enter Philip Montgomery for his first year in 2015. Offense was not too much an issue for Tulsa, as they averaged 24.7 points and 413 yards per game in 2014. This year, Tulsa will have 10 starters back on offense with the only replacement being at left tackle. Dane Evans threw for 3,102 yards with 23 touchdowns and 17 interceptions while undoubtedly looking for Keevan Lucas again. Lucas had 101 catches for 1,219 yards and 11 touchdowns. Also back are running backs Zack Langer (801 yards and 4 touchdowns) and James Flanders (456 yards and 1 touchdown). Even with a new coach/system in place, Tulsa will be putting up some points in 2015. The defense was a mess in 2014 for Tulsa. Despite having eight starters back, they gave up 39.3 points and 487 yards to opposing offenses. Six starters return this year with three on the line. Derrick Alexander was a monster in 2014 with 42 tackles, 7.5 sacks, and 4.5 tackles en route to making the AAC’s 2nd Team squad. Linebackers Craig Suits (81 tackles, 1 sack, 6.5 tackles for loss, and a pick) and Trent Martin (64 tackles, 1 sack, and tackles for loss) are also back. The front seven will need to better because there is only one starter back in the secondary. Safety Michael Mudoh was the top tackler for Tulsa last year with 113 stops while also intercepting two passes. The defense should not be giving up nearly 40 points and 500 yards a game in 2015. Tulsa will face Florida Atlantic at home followed by road trips to New Mexico and Oklahoma to start the year. After opening AAC play at home to Houston, they will face UL-Monroe at home as well to finish their non-conference schedule. What hurts Tulsa in conference is that they will be facing the trio of East Carolina (road), Central Florida (home), and Cincinnati (road) from the East and those three are in contention to win the division. Tulsa should have a better season, but still have a tough road ahead of them in 2015. SMU was taken over in 2008 by June Jones and he did a great job leading the Mustangs back to a bowl game in his second season in 2009. They won that game with ease against Nevada 45-10 and Jones followed that up with three more bowl in a row (3-1 in those games). After being blown out by a combined score of 88-6 in the first two games of 2014, Jones resigned while SMU crashed to a dismal 1-11 record. Chad Morris takes over after several seasons in charge of the explosive Clemson offense. There is no other way to talk about SMU’s offense in 2014 other than to say it was putrid. They put up only 11.1 points and 269 yards per game. Nine starters are back in 2015 and the quarterback duties will likely not be split up between three players. Matt Davis took all of the top reps in spring after throwing for 855 yards, 3 touchdowns, and 5 interceptions last year. Davis also ran for 613 yards and 4 touchdowns, which makes him a dangerous dual threat QB. The duo of Prescott Line and Daniel Gresham will battle it out at running back, but the top running back in 2014 was Line with 256 yards and 4 touchdowns. Two of the top three receivers are gone while Darius Joseph (54 catches for 379 yards and 2 touchdowns) and Deion Sanders Jr. (son of former NFL player Deion Sanders; 23 catches for 188 yards) will be likely to take over starting spots. The entire offensive line returns, but will have to learn new schemes. It is safe to say that SMU will be putting up better numbers in 2015 with Morris in charge. The defense has seven starters returning from a unit that gave up 41.3 points and 499 yards per game in 2014. Three starters will return on the defensive line, but they surrendered 236 yards per game and 5.2 yards per carry in 2014. Linebacker Jonathan Yenga recorded 65 tackles, 2 sacks, and 2.5 tackles for loss in 2014 and he will anchor his unit. Three starters are back in the secondary led by Darrion Richardson. He had 69 tackles, 1 sack, 2 tackles for loss, and an interception. SMU really cannot get much worse than their 2014 performance. SMU will face Baylor and North Texas at home before a road game at TCU in the third week. James Madison will visit in the final weekend of September before SMU kicks off their conference slate. SMU has a brutal AAC schedule having to face the likes of East Carolina, South Florida, and Temple from the East in addition to the five other teams from their division. SMU will be better, but may finish with double digit losses again. Much like the AAC’s East division, the West is also wide open. Any one of three teams – Navy, Houston, or Memphis – look solid enough to claim the title. Tulane will be close to bowl eligibility while Tulsa should fare better in 2015. SMU is in rebuilding mode, but Chad Morris is pointing them in the right direction. Below is the predicted order of finish. We predicted that Temple would win the AAC East on Tuesday and Navy will capture the West division. What a matchup that would be to see if it does indeed happen. Here, we will call for Navy to win the AAC West and the AAC Championship Game in their first ever season in a conference. Check back on Tuesday, July 28 for a double release preview of the Sun Belt Conference as well as the FBS Independents.